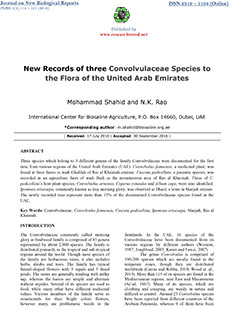 Three species which belong to 3 different genera of the family Convolvulaceae were documented for the first time from various regions of the United Arab Emirates (UAE). Convolvulus fatmensis, a medicinal plant, was found at three farms in wadi Ghalilah of Ras al Khaimah emirate. Cuscuta pedicellata, a parasitic species, was recorded in an agriculture farm of wadi Baih in the mountainous area of Ras al Khaimah. Three of C. pedicellata’s host plant species, Convolvulus arvensis, Cyperus rotundus and Allium cepa, were also identified. Ipomoea eriocarpa, commonly known as tiny morning glory, was observed at Dhaid, a town in Sharjah emirate. The newly recorded taxa represent more than 15% of the documented Convolvulaceae species found in the UAE.